The outdoors holds a natural appeal to us humans. The hues of the sky, the fresh air, glistening water, the ripples on a sand dune; outdoor elements make us feel refreshed, calm and one with the earth. So how can bring some of these restorative elements into our homes? The obvious way may be to embrace the added responsibility and bring live greenery into our living space. Yet as refreshing as that might be, there are other, simpler ways to bring the outdoors in and create a “transterior”: the latest buzzword in home design and a way to explain the utterly seamless segue from home to garden – all while staying inside. Start by bringing plenty of natural fibres, textures and patterns into your home. Think wicker, rattan, hemp and jute materials, all of which are inspired by nature and can help you create a comfortable oasis to relax in. 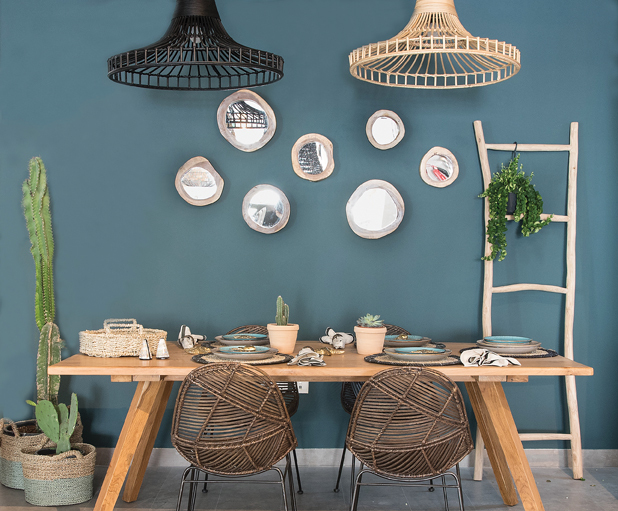 Check out the wide variety of baskets available everywhere from Maisons du Monde to the Dubai Garden Centre as well as gorgeous and affordable two-tone options at Home and Soul Dubai that would lend themselves perfectly to a grouping. Find jute rugs at Ikea, West Elm and Home and Soul. The rattan side tables at Urban Nest are the perfect size to accessorise a cosy reading nook. And consider wicker light fittings from The Bowery Company for that final touch. Use the newly launched Bali collection at Home and Soul Dubai as the perfect stepping stone to decorating a home that brings the natural, sustainable vibe of the outdoors to your interior. The collection features handmade products and woven home accessories made out of rattan, cotton, coconut, wood and bamboo, all sourced from Bali. Their wooden island bowls are perfect for showcasing the latest interior decor trend of decorating with fresh fruit and vegetables. Consider a bowl of lemons on your kitchen countertop and a fruit stand stocked with a pineapple, some mango and crisp, green apples on your dining table for outdoor inspiration that combines both a visual and aromatic aspect. Whether you’re confident enough to bring in plenty of live greenery, or would prefer to go the faux plant route, it’s time to think outside of the conventional planter. Certainly don’t settle for the plastic containers that you first purchased your greenery in. Instead make a statement with the unexpected, as they are now available in every material under the sun, from modern cement molds to rustic wooden boxes. We’re in love with The Bowery Company’s newest additions; metal planters and plant boxes in all shapes and sizes, and in a variety of different hues. Other alternatives are terrariums. Crate&Barrel have an excellent collection, and there’s an affordable hanging glass terrarium filled with faux mini succulents at Jysk that would go well in any room of your home. The next step is to consider your colour scheme. If you can keep things neutral with plenty of natural texture, then you can use accessories like your couch cushions, your area rugs, your art, your bedding and your vases, ornaments and shelf fillers to interject colour where you need it. Greens evoke the earth, grass and plants, blues are refreshing, yellows are uplifting and hint at freshness and more neutral tones like whites, creams, tans and beige give a natural, clean interior palette. Let in as much natural light as you can be replacing any heavy drapery with lighter fabrics and sheers, and it doesn’t have to be expensive to do so. Ikea and Maisons du Monde both sell affordable sheer curtains and linen panels in a range of hues and textures. Think of it this way: you’re creating an indoor shelter for yourself when the weather is bad, whether that means the storms of winter or the unbearable heat of a desert summer. Incorporating plants and greenery – whether in the form of cotton botanical wall charts like the ones by HK Living stocked at Urban Nest Dubai, or by housing florals and green foliage in an assortments of vases such as the gorgeous variety available at Emaan Home – adds a touch of both comfort and luxury to a home. Add to that great furniture you can recline on for hours and you can truly have the best of both the indoor and outdoor worlds.